The Hammerli Model 103 Free Pistol is the one modern firearm that can claim direct descent from the dueling pistols of the 18th century. The annual parade of new products at the SHOT Show is now a deluge, so overwhelming that no one can possibly take in everything, much less evaluate it all. And anyway, in my lifetime with guns, there are still many old but fascinating artifacts I have not yet worked with. One such is the Hammerli free pistol. The Olympic free pistol is the one modern firearm that can claim direct descent from the dueling pistols of the 18th century. Those were single-shot muzzleloaders, exquisitely crafted to deliver the ultimate in reliability, made in matched pairs, and fitted with hair triggers. Among others, the Manton brothers of London made dueling pistols, and this led indirectly to the English “best” shotgun. Dueling survived on the Continent long after it declined in England. In Paris in 1812, Gastinne Renette set up an indoor shooting range to teach young men how to shoot, should they be challenged to a duel. Gastinne Renette survived as a dealer in fine sporting guns until 2003. Through the late 19th century, competitive shooting with handguns became popular, and a whole generation of “gallery” guns was developed for indoor competition. When the Olympics were revived in 1896, shooting events were prominent. The “free pistol” event was exactly as it sounds, competing with a pistol that was almost completely free of restrictions. 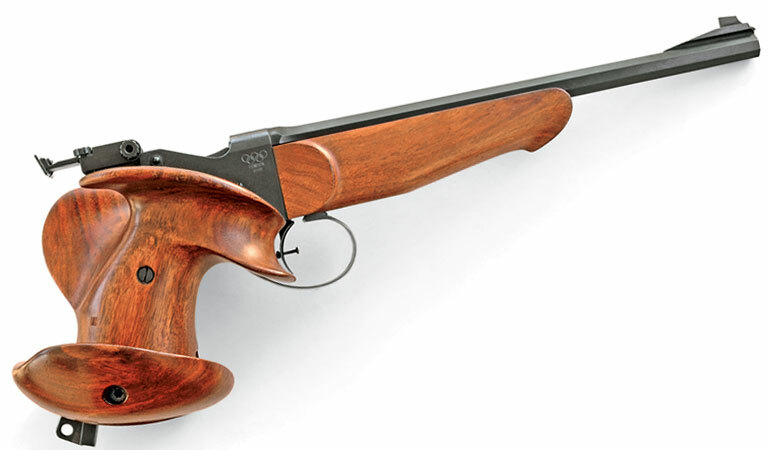 Any barrel length, weight, trigger pull—the object was to produce the best score with no equipment limitations other than the use of open sights. The greatest names in handguns produced pistols for these competitions, including Webley and Beretta. After 1945, the one that dominated was Hammerli of Switzerland. It became the name in target pistols. Today, the Olympic free-pistol event consists of 60 shots at 50 meters (54.68 yards), with a two-hour time limit. The 10-ring is five centimeters (1.97 inches) in diameter, and the current record is 583/600. For this, competitors cheerfully pay $10 a box for 50 rounds of Eley Pistol Match ammunition, compared to $2.25 for standard stuff. Having been intrigued by Hammerli free pistols since my teenage years, but never handled or shot one, when I came across a classic from 1960, I snapped it up. The urge to see how I could do, compared with Olympic masters, was irresistible. In 1956, Hammerli introduced a new model: the 101. It was followed by the 102 and the deluxe Model 103. A modified design (104–107) replaced that family in 1961. Mine is a 103, and while it is an unapologetic target pistol, it retains the hallmarks of dueling-pistol craftsmanship: a lovely walnut stock with graceful Schnäbel, an 11-inch octagonal barrel, and the classic trigger bow that graces a London gun. The Hammerli 103 was the only pistol included in the New York Museum of Modern Art’s “Design in Sport” exhibition, held in the early 1960s. The later Model 107, the deluxe member of the 104 family, was in the “Tools of Man” exhibit at Expo ’67, the Montreal World’s Fair. Hammerli built these pistols using a scaled-down Martini-Henry action. The breechblock is operated by a lever inside the grip, and cocking is a separate action with a lever on the side. The trigger can be adjusted down to a fraction of an ounce. A lockable screw protrudes from the trigger face, and this is adjusted to suit finger length—vastly easier than moving the trigger itself. The trend in competition pistols today is to purely high-tech functionalism. Who cares what it looks like? The score is what matters. The Hammerli 103, however, is a throwback to the original principles that guided the crafting of dueling pistols, and like an English shotgun, you can just sit back and admire it. When the time comes to burn powder, however, it is a tightly crafted machine. Not only can you win matches, but also you’ll look like a gentleman doing it.